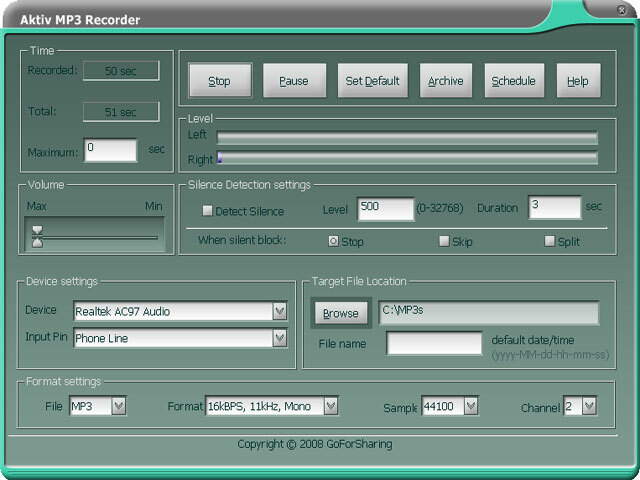 Aktiv MP3 Recorder - Aktiv Recorder is a total sound recorder. Aktiv MP3 Recorder is an all-in-one audio software built to convert CDs, tapes, DVD s, live performances, TV, Internet radio, video games and any other sound source into audio files stored on your computer. The program supports a large variety of popular formats such as MP3, WMA, OGG, VOX, AU, AIFF. All you need to do is select the format you want and click Record CD. Required file format conversions are executed automatically using smart caching to prevent duplicate conversions. Aktiv MP3 Recorder is an exceptional tool for protecting your valuable recordings: once you've configured the settings - the sound source, the recording quality, and volume, you can start recording. The user-friendly interface lets you perform numerous operations with audio data such among which displaying a waveform image of an audio file, filtering, working with different audio effects and an equalizer to increase the sound quality of all recordings. The application can be very easily configured to start automatically at startup. Aktiv MP3 Recorder also offers schedule recording tasks (which is the easiest way to record your favourite TV or Internet Radio shows) and is able to save your settings by default. The program imposes no time limit - you have unlimited recording time. Any file you record can be named after your own choice and saved it in the directory you want. The main window includes an Archive button to help you with a quick view or browse all recorded files, delete any redundant files or play recorded files in its built-in media player.